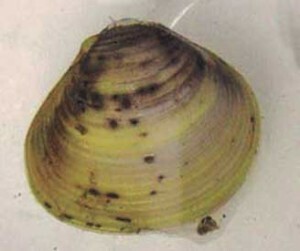 Small freshwater clam that is triangular in shape; color is yellowish to blackish-brown. 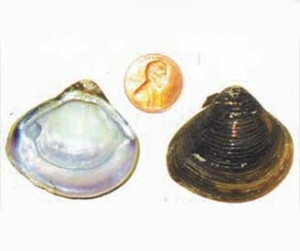 Shell is incredibly thick and difficult to break compared to native clams. Found in freshwater at the sediment surface or slightly buried; prefers fine clean sand, clay, and coarse sand, although this species may be found on most any underwater surface. Found in the Platte River to the Wyoming border and in the Missouri River. Also various reservoirs in the salt creek watershed; Branched Oak Reservoir. Introduced into the U.S. as a food item for humans. Spread by the aquaculture industry and aquarium dumping. Bait buckets, live wells, bilge water, boat hulls/motors/trailers, and other equipment like fishing or diving equipment could potentially be contaminated with clams or free-floating microscopic larvae and transported between waters. Filters suspended matter from the water column, which significantly increases water clarity and leads to excessive plant growth and alters nutrients regimes. May compete with native clams; can infest and interfere with irrigation systems and canals, and block water flow through industrial water intake pipes.